Consumers pay over a half billion dollars more than necessary each year to register .com domains. Verisign (NASDAQ: VRSN) is currently in negotiations with the U.S. Department of Commerce with regards to the Cooperative Agreement to run the .com domain name. The agreement expires November 30 of this year. The Department of Commerce has the sole discretion to extend the term of the agreement. It’s the Department of Commerce, through the Cooperative Agreement, that effectively sets price controls on registrations and renewals .com. Verisign has a contract with ICANN for running the domain but the Cooperative Agreement can mandate price controls in the ICANN agreement. In the past, ICANN granted Verisign the ability to raise prices in .com. The DOC stepped in and froze the amount Verisign charges registrars at $7.85 per domain per year. Verisign also has a presumptive right of renewal with ICANN for the .com contract. It got this right after negotiations with ICANN following a lawsuit. Unless Verisign really messes up, or if there’s an antitrust ruling, Verisign gets to run .com in perpetuity. So in some ways, considering what the cost of .com would be if the contract was put out to bid is a pointless exercise. However, it’s relevant to the Department of Commerce and National Telecommunications and Information Administration (NTIA) as they consider what to do with the Cooperative Agreement. Verisign’s business is effectively an exclusive contract to run .com. (While it also runs .net and a handful of other top level domains, its business is built on .com.) It has extremely high margins and these margins are akin to a tax on consumers around the world. Let’s take a look at the margins. In 2017, Verisign had a gross margin of 83.4% and an operating margin of 60.7%. These numbers are staggering. According to CSIMarket, the S&P 500 combined gross margin is typically in the mid-40% range and operating margins are in the mid-teens. CSIMarket shows that gross margins for communications services companies are near 80%. But the operating margin of these companies is still typically in the teens. Verisign is printing money. Every additional domain that is registered drops directly to the bottom line after paying ICANN 25 cents. That’s why investors love the company. Even as the S&P 500 and tech sector valuations have skyrocketed, Verisign has outpaced them. 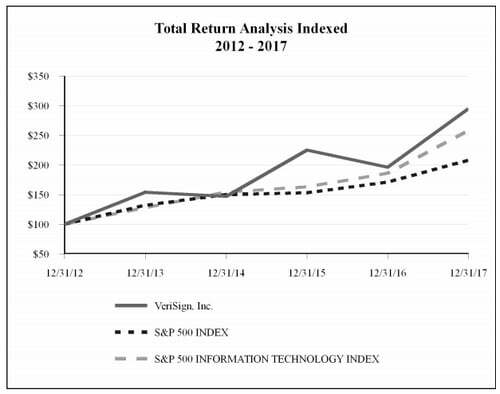 A chart of Verisign’s stock returns from the company’s 2017 annual report. How much would a competitor bid to run .com? It would certainly be lower than $7.85. Consider a recent bid to manage the registry for India’s .in domain name. According to MoneyControl, Neustar bid just 70 cents per domain. Its rival Afilias offered to run it for $1.65 per domain. These are competent registry operators. Neustar runs .us, .biz and .co. Afilias runs .info and .au. These companies also manage the registries for hundreds of other top level domains. While .com comes with challenges of scale, it also benefits from economies of scale. Now, consider what the above-market contract with Verisign means for consumers. Let’s be generous and say that the best competent bid to run .com would be $3.50 per name. With 137 million .com domains currently registered, that means consumers across the globe are paying about $600 million in extra fees per year than necessary. That amount only grows if Verisign gets the right to increase prices. That’s a big tax on the world’s consumers that exists primarily because the .com contract can’t be put out to bid. It’s not a market-price situation. That’s where the Department of Commerce needs to step in. With the Cooperative Agreement, it is the only entity that can control the price of .com domain names. It should exercise this power. Agree, there should be a competitive public auction, open also to foreign companies, to assign the rights to run the .com names, that would benefit consumers. IMHO the assignee should also respect a mandatory price cap tied to the inflation rate. One must keep in mind that W E B is largest shareholder of VRSN. He likes his margins and moats, and he’s a long term investor. Would take a monumental effort to pull this money out of Buffett’s coffers. You’re talking about the wholesale pricing not the “consumer” pricing and to be frank I’m not sure if “consumer” is the right word to use in the context of the .com pricing or contract. For the average small business that registers a domain name in order to have email and run their online presence the price of a .com isn’t that important to them. Looking at the overall costs for running any business with email, hosting (or the price for a platform like Shopify) the domain price is negligible. So I think the concern you are trying to raise is more important to professional domain name registrants who are carrying very large volumes of domain names and for whom the price change would have a tangible impact. I’ve no issue with you or anyone else defending that position and as a registrar I can also see an upside to a lower wholesale price for .com domains. However I wouldn’t conflate a registrar perspective or a domainer perspective with that of an actual “consumer’. $2.5 is a good price and the registry would still be profitable. The Department of Commerce has to stop this tax (in the hundreds of millions per year) paid by consumers worlwide. It is a totally unneeded tax that one company is raking in, hand over fist. Mind you this is not the company that even created domain names, but a lowly company that used the legal system to force its way into such a monopolistic position. This is the all for profit company that wants to change the way dot com domains are run. It is extremely important that the powers that be see and understand what is going on, and realize the need for immediate, decisive, and corrective action! Fascinating analysis, Andrew. Thanks for posting. Aside from the topic of pricing, we should also be concerned about the lack of transparency surrounding the renewal of the Cooperative Agreement, and the presumptive renewal of .COM. For a contract representing this much economic value, good governance requires a more diligent renewal process. It would be under $1 in my view, even with everything based in the US. The volume is huge. Consumers are paying way too much, it is a monopoly situation with no competition. Icann and the US government need to “grow some balls” on this issue. Best that will happen for domain investors out of Coop agreement renewal is price freeze. COM has grown so big that transferring it to another registry can be catastrophic. Verisign has built so much redundancy globally to keep 100% uptime for COM/NET resolution. It will be a multi year effort for anyone to match that level of redundancy. ICANN/US govt might be unwilling to take that chance. Again, burden on businesses for registry fee is negligible compared to what they spend on business. Hah. That is a joke. Com was huge when Verisign sued ICANN which led to this stupid evergreen contract. This is not a new thing. Com domains have always held huge market power and had no less of an advantage when Verisign decided to use legal means to wrangle an evergreen contract. On the opposite end the US and ICANN should realize what is being done could be done for free, and with just as much stability within blockchain. If Verisign can’t evolve, it is time to give someone younger, more nimble and less monopolisitc a chance to run this with less corporate BS and overhead and attorneys. Hmm! While there is certainly room for a lower registration fee for dotCOM, there are also some points to be made for keeping the price higher. -Drop the price too low and you will attract abusive registration. A higher price is no guarantee against abuse, but it helps. The cheaper a domain gets, the more everyone will have to work to combat abuse. -“Normal registrants” who hold maybe 1-5 domain names for their business or for vanity will not benefit that much as the price of a domain is negligible to their bottom line even now. Domain names are still very cheap; most supplemental services (hosting, SSL, mail) cost more than the domain. -Higher fees leave more room for registrar margins. Hey, we got to make a living too! On the other hand, if you own a large portfolio of domains, you would probably notice an impact. Parking could become viable again when the price drops to where the revenues are now. Protective registration portfolios would become slightly cheaper to maintain and if you hold a bazillion domains for later resale, your annual renewal cost would also drop. I’m not necessarily in favor of lower prices for the reason Volker mentions. $1 .com domains could be a catastrophe. I do think there’s good reason for the DOC to hold the line on price increases, though. In the long run something in line with inflation might make sense. I also don’t think that a company other than Verisign needs to run the domain. They clearly do a good job of it. But it’s clear that the market price if put out to bid would be below $7.85, which is a good reason for the DOC to not allow price increases.